As TV technology stormed into American homes during the early 1950s, more and more people started to ask, why don't we use this stuff on the battlefield? They imagined a world where commanders could remotely monitor the activity of troops on the ground — maybe even from halfway around the world. The January 1952 issue of Mechanix Illustrated magazine featured an article written by Colonel Robert Hertzberg and illustrated by Frank Tinsley that envisioned just such a future. The always fantastic Modern Mechanix blog has a copy of the article. The piece was titled "Why Don't We Have Battlevision?" and presented a future that was for the time, still pretty sci-fi. 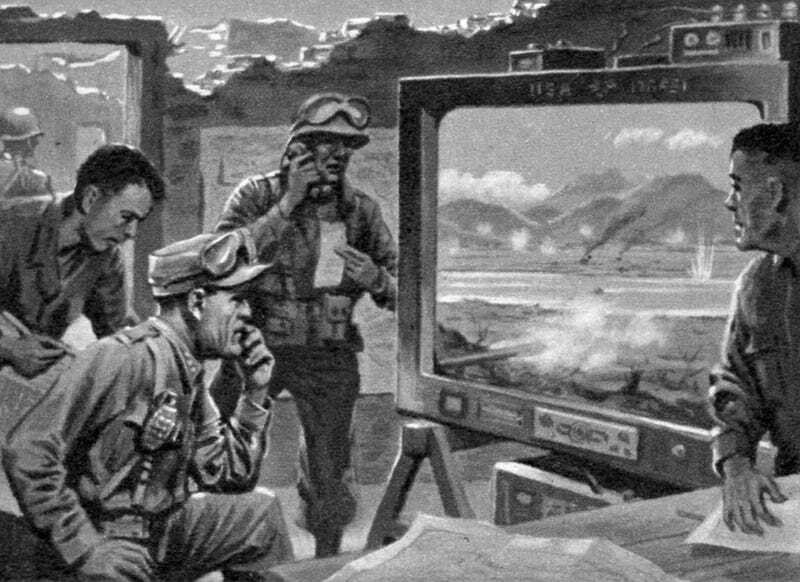 "Tomorrow's generals may be able to tune in on the battlefield courtesy of television, relayed to headquarters by battle-going TV Seeing Eyes." It seemed only natural that military-minded people of the 1950s would take a look at this relatively new technology and wonder why it wasn't being used more effectively for military purposes. If it was good enough for football, why not war? This is no fantastic rambling of science-fiction! If there is another war, it will provide definite opportunities for the use of modern television miracles. TV set owners now enjoy better views of athletic contests than do most people right on the scene. Powerful telephoto lenses reach across playing fields and give spectacular close-ups of a runner dashing for the goal line or of a fielder snatching a high fly. Wide-angle lenses broaden the view and produce panoramic effects of great sweep. "Why," military people ask, "can't we do exactly the same thing on battlefields that the commercial TV stations are doing on football fields? Our game is rougher and is played for keeps but that's just why the head coach the commander of an army in combat should be able to follow the moves of the members of his team. If he can see what's going on while it's going on, he won't have to wait for reports from his subordinate commanders. Why can't mobile TV vehicles be assigned to combat units just as conventional communication trucks are, so that the commander can instantly see the fighting in any particular area?" In other words, why don't we have battlevision? It was all perfectly logical, even from (and perhaps especially from) the layman's perspective. By 1952, television was invading American homes at an incredibly rapid pace. Just 8 percent of American households had a TV in 1950. By 1952 that number would blossom to 32 percent of U.S. homes. In 1954 it was 60 percent. But this was far from the first time that people were wondering about potential uses for television in battle. As early as 1924, visionaries like Hugo Gernsback were imagining TV-equipped drones. During World War II, the U.S. even tried (with limited effectiveness) to use unmanned aircraft fitted with TV technology for surveillance. Below, we see Tinsley's illustration of what a futuristic tank might look like — complete with TV camera periscope capable of 360 degree rotation. It was quite the leap from the crude yet futuristic flame tanks of the 1930s to the post-WWII high-tech tanks of tomorrow. But it was the natural progression of American war in the popular futurist's imagination: the introduction of high-tech gadgets to help us win on the ground.